A native of St. Catharines Ontario, David Hetherington was for many years the Toronto Symphony Orchestra’s Assistant Principal Cellist. He received his musical training at the Royal Conservatory of Music and the University of Toronto, and furthered his cello studies in New York, Italy and Germany with Claus Adam, André Navarra and Paul Tortelier. Mr. Hetherington teaches at the Glenn Gould School at the Royal Conservatory. He coaches the cello sections of the Toronto Symphony Youth Orchestra and the National Youth Orchestra of Canada, and is Music Director of the Inter-Provincial Music Camp near Parry Sound, Ontario. As soloist, Mr. Hetherington has performed with the Toronto Symphony Orchestra, the Saskatoon Symphony Orchestra, the Sault Symphony Orchestra, the Niagara Symphony, the Symphony Orchestra of Canada, New Music Concerts and Soundstreams Canada as well as recitals at the University of Toronto and the Royal Conservatory of Music. As chamber musician, he has toured Canada, the United States, Mexico, China and Europe, appeared at the Ottawa, Elora, Sweetwater and Kincardine Music Festivals and performed with many internationally renowned artists such as Shmuel Ashkenasi, Emmanuel Ax, Isabel Bayrakdarian, Measha Brueggergosman, James Ehnes, Heinz Holliger and Arnold Steinhardt. He appears regularly with the ARC Ensemble of the Royal Conservatory with whom he has toured and recorded. In addition to the Amici Chamber Ensemble, Mr. Hetherington is also a founding member of the string quartet Accordes, which performs regularly for New Music Concerts, Soundstreams Canada and other contemporary music organizations. In 2001, the Canadian Music Centre, through Centrediscs, released Accordes’ recording of Harry Somers’ String Quartets, for which it received a Juno Award nomination. 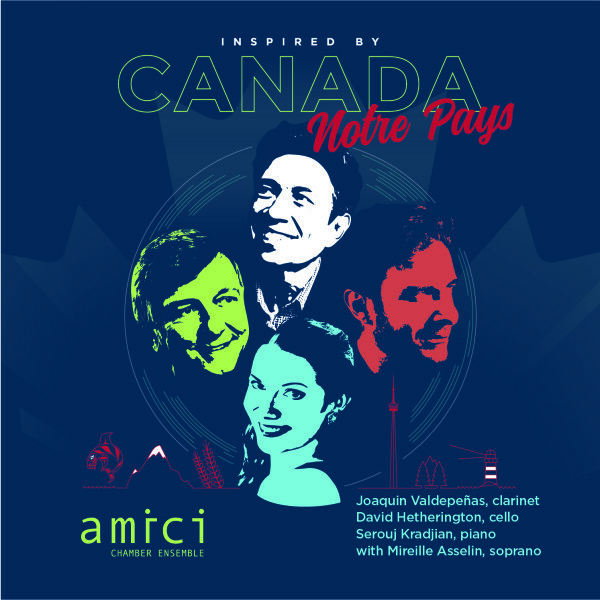 Accordes has also recorded works by several other Canadian composers such as Norma Beecroft, David Eagle, Harry Freedman, Hope Lee, Alexina Louie and Jean Papineau-Couture. Mr. Hetherington has appeared on several recordings for the CBC and for Centrediscs with whom he made the Canadian première recording of Talivaldis Kenins’ prize-winning cello sonata. He has been active in performing and recording much contemporary music and has recorded solo cello pieces by Alice Ho, Chan Ka Nin (CBC Records) and Elliot Carter (Naxos). In addition, he has collaborated personally with many other composers such as Brian Cherney, Henri Dutilleux, Heinz Holliger, Helmut Lachenmann, Magnus Lindberg and Alexina Louie for performances of their works for solo cello. All of these performances were recorded for broadcast by the CBC.